This delicious chicken kebabs recipe uses Scottish ingredients such as heather honey and can be cooked indoors or enjoyed outdoors on the BBQ. Place the breasts into a ceramic dish and cover with the marinade of honey, lemon juice and rind and the thyme and some black pepper. Leave them to marinade for at least 30 minutes so that the flavours soak through into the breasts. Thread the marinated chicken breasts onto skewers and cook on a BBQ or grill until cooked through and all the juices run clear. To prevent them from drying out during the cooking spoon some of the marinade over the kebabs. 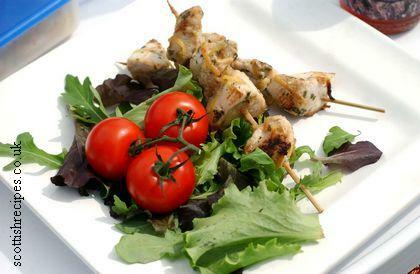 Serve the chicken kebab with a seasonal salad and pitta bread. We would like to thank Sainsbury�s for this chicken kebab recipe and photograph which formed part of their Eat Britain campaign. To read more about it visit the Scottish Cooking And Recipes From Scotland page.